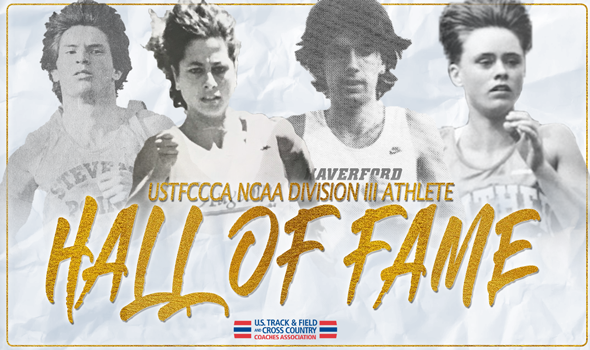 NEW ORLEANS – The U.S. Track & Field and Cross Country Coaches Association (USTFCCCA) is ready to open up the doors of the NCAA Division III Track & Field Athlete Hall of Fame to four more deserving individuals. The Class of 2018 includes Kevin Foley (Haverford College), Turena Johnson (Luther College), Carolyn Ross (Augsburg College) and Arnie Schraeder (UW-Stevens Point). This is the 15th group to be inducted into the Hall of Fame, which started in 2004. The Class of 2018 will be honored at the 2018 NCAA Division III Outdoor Track & Field Championships in La Crosse, Wisconsin. For 23 years, Kevin Foley was the only man in NCAA DIII history to win three national 1500-meter titles in a career. While that distinction fell in 2006 when fellow Hall of Famer Nick Symmonds won his third, Foley remains the only man to accomplish that feat in consecutive years. Back in the early 1980s, Foley dominated the outdoor mid-distance scene. Foley won his first NCAA title in 1981, followed that up with another in 1982 and the final one in 1983. It was in 1982 that Foley set what still stands as the meet record in the event (3:44.50). Foley went undefeated against NCAA DIII competition in his last three years with the Fords. “On their best days, we’ve had a few guys who could match Kevin Foley as a competitor, but we’ve never had anybody who could surpass him,” Haverford coach Tom Donnelly once told the college’s athletic website. Foley is the third athlete from Haverford College to be inducted into the Hall of Fame, joining Karl Paranya in 2010 and Seamus McElligott in 2013. Turena Johnson had a legendary career at Luther College. From 1996 to 1997, if there was a distance event contested at an NCAA meet, Johnson would likely be the first across the finish line. In fact, Johnson captured five of the eight NCAA titles during that span (NCAA DIII didn’t run the 3000 between 1991 and 2013). In 1996, Johnson won the individual cross country title and added the 10000-meter crown outdoors in a time of 36:01.7. The following year, Johnson won the indoor 5000 and completed the distance double at the outdoor championships. Johnson continued her career post-collegiately, which has been highlighted by a third-place effort at the USA 25K Championships and a sixth-place finish at the 2008 U.S. Olympic Team Trials – Marathon. She is the first athlete from Luther College to be inducted into the Hall of Fame. Carolyn Ross was historically fast. Back in 1988, Ross became the first woman in NCAA DIII history to crack the 60-second barrier in the 400 hurdles when she broke the tape in 59.65. Ross lowered that record the very next year as she clocked a time of 58.99 to win one of her five NCAA DIII titles. Here are two fun facts: Another woman wouldn’t go sub-60 in the 400 hurdles until 12 years later and Ross’ record in the event stood until 2014. Ross also earned nine All-America honors in addition to those five national titles. She is the first athlete from Augsburg College inducted into the Hall of Fame. As an athlete at UW-Stevens Point, Arnie Schraeder did his best work outdoors. Between 1985 and 1987, Schraeder won three national titles on the track with two of them coming on the outdoor circuit. Schraeder captured back-to-back titles in the 1500 in 1985 and 1986 is one of nine men in NCAA DIII history to accomplish that feat. His other national title came in 1987 when he won the indoor 5000 crown. Schraeder also fared well in the outdoor version of the 5000 despite not winning a national crown. He sits as the fifth fastest man in NCAA DIII history with his time of 13:57.0. And while this doesn’t pertain to the track, Schraeder dazzled in 1986. Schraeder won the individual title at the NCAA DIII Cross Country Championships in Fredonia, New York, then turned around the following Monday to finish 11th at the NCAA DI Championships in Arizona. Schraeder is the first athlete from UW-Stevens Point inducted into the Hall of Fame.